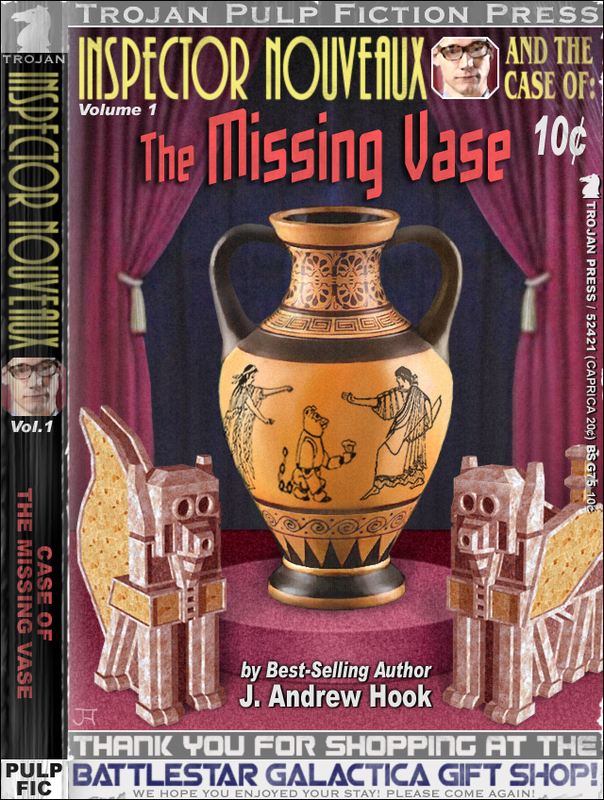 Inspector Nouveaux and the Case of the Missing Vase! The notorious Space Monkey Vase is quite possibly the most famous hoax of all time. It was unearthed by a destitute farmer nearly a century ago on the planet Tauron. The farmer claimed that the vase was indisputable proof that an ancient breed of extinct Space Monkeys once lived in peace and harmony with humans during a forgotten age in humanitys distant past. Masquerading as an archeologist and professor of antiquities, the farmer eventually sold the vase to the Delphi Museum on the planet Caprica in exchange for a small fortune. While scholars of the time debated whether or not the Space Monkey depicted on the vase was holding a strangely shaped mushroom or a corn muffin, geologists were developing new methods of carbon dating which ultimately proved the Space Monkey Vase to be a fraud! In this day and age, the Space Monkey Vase is stored on a pedestal in the childrens wing of the Delphi Museum. Security measures at the Delphi Museum are state-of-the-art and even the Space Monkey Vase is protected by motion sensors and a laser-guided alarm system. And yet someone manages to steal the vase in broad daylight! Embarrassed and confused, the Delphi Museum decides to hire Capricas foremost antiquities detective, Inspector Nouveaux, who has built a reputation for solving unsolvable crimes. But this case has him stumped! Who would go to such extraordinary lengths to steal such an obvious forgery? And who would be willing to murder the museums curator in order to cover up the theft of such a worthless prize? And what does any of this have to do with the heretical tales first inscribed by a secret Cult of the Space Monkeys? Fear not, Inspector Nouveaux is on the case! Shhhhh! There is a Trojan hiding behind the curtain on the left. If you look closely, you won't see him. As any art critic worth a frak will tell you, there ain't no such thing as a Space Monkey Vase! In fact, there are no Space Monkeys! They never existed! To claim otherwise is to possess an ignorance so cosmically vast that it would take your breath away! Leaving aside, however, the apparent and blatant disregard on the part of the author for any historical and scientific accuracy, I found the book quite enjoyable. Even though Inspector Nouveaux is clearly a complete wussy (not to mention, a frakking idiot!) his exploits in the world of art dealership and museum back rooms are rather amusing. 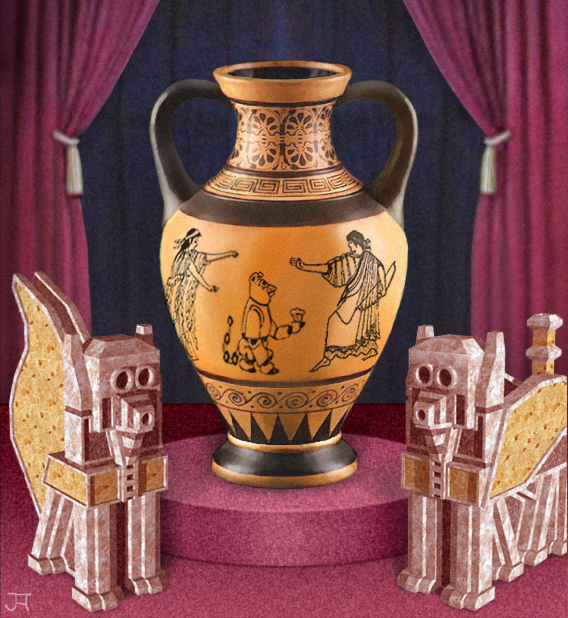 And, of course, the real compelling plot twists come into play when the novel focuses on its sole female hero: Miss Emma Honeybunn, the delectable curator of the Delphi Museum's Vase Collection. It is cleverly and insidiously indicated in the book that Miss Honeybunn is the one who solves the mystery, not the ever-blundering Inspector! And she would have done so a lot more quickly if she weren't constantly accosted by the supposed hero's still-born witticisms and sexual advances. So, take the book for what it is: an unrealistic but fun ride into the fictional world of not-quite historical artifacts, smart women, and frakking idiots with axes to grind! You will laugh, you will cry (because you are laughing so hard! ), but you will not be indifferent!